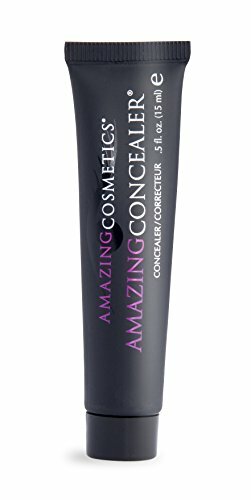 AMAZING COSMETICS Concealer, Medium Beige, 0.5 fl. oz. The amazing concealer isn't just for under eye circles. It is a multipurpose product that is formulated to literally erase any skin imperfection, from under eye circles and blemishes to uneven skin tone and sun damage all the while remaining undetectable on the skin. This cream-based formula is long wearing and no matter how much you apply-you'll never see it sitting on top of the skin. It can also be used to highlight and contour cheekbones, prime and define lips, define and highlight the brow and contour the nose and jawline. The amazing concealer, known as the "magic eraser" by professional makeup artists, can also be mixed with the anti-aging face primer to create a tinted moisturizer. Celebrating women of all skin tones and ethnicities, amazing concealer is available in 20 shades, making certain that no skin tones is left behind. no.1 recommended concealer brand by professional makeup artists, and a favorite of celebrities and makeup enthusiasts from around the world. Your skin looks like skin, only flawless. The amazing concealer technology-water-resistant, 3x's pigment and skin-like finish, sets this concealer apart from the rest. If you have any questions about this product by AMAZING COSMETICS, contact us by completing and submitting the form below. If you are looking for a specif part number, please include it with your message.